1. Client must have the puppy examined by a licensed veterinarian within (72) hours of purchase at the buyers expense. 2.If the puppy is examined within (72) hours of purchase with a signed statement from a licensed veterinarian that the puppy has a serious genetic or health problem, the puppy may be returned to us, along with all health records, registrataion papers and the original sales receipt, the seller agrees to refund the original purchase price of puppy or replace that puppy with another Beagle Barn puppy. 3. 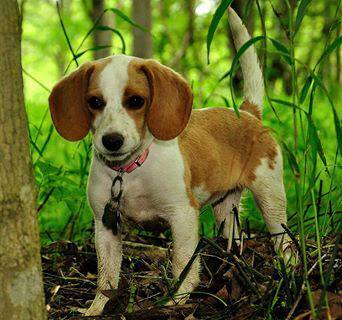 If your dog is found to have a genetic or hereditary disease and it results in death of dog under the age of 4, The Beagle Barn will replace the dog with another Beagle Barn puppy of equal value to the price you originally paid. Such replacement shall be good for 90 days from the date of death of pet and price difference agreed upon. Also written exam from a licensed veterinarian stating that it is a genetic or hereditary disease will need to be given to The Beagle Barn. 4. In the event this Lifetime Guarantee is exercised, client will provide seller with a death certificate with proof of diagnosis from a licensed veterinarian. 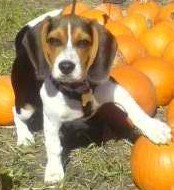 Client must also return all registration papers to The Beagle Barn. 1. To ensure none of our dogs evers ends up in a shelter or homeless, we do offer to take them back and find them a good home when the clients has at least tried on their own to find their dog a new home. 2. Effort and responsibility has to be shown by the client in the form of at least running local newspaper ads for at least two weeks prior to returning the dog. Proof of clients effort must be provided, along with all registration papers and up to date health records must returned to The Beagle Barn at the time the dog is received back into our care. It is understood by both parties that No refund of original purchase price of dog will be refunded to client for dogs return. 1. Puppy must be taken to a licensed veterinarian within (72) hours of purchase at buyers expense. 2.If puppy is found to be ill on it's first vet visit, the puppy can returned to the seller within 72 hours of purchase (for refund of original price paid) or buyer can keep the puppy and have their vet treat the illness. A itemized copy of vet bill (showing illiness, diagnosis, medication given) must be sent to seller and the seller agrees to pay for the prescription medication only cost; up to a maximum of $100.00. This does not include cost of future dewormings or parasite medications, due to normal routine puppy care. Or future vaccines due to normal routine puppy care. 3. It is important for you to know we do everything we can to ensure you a health puppy. Your puppy is vaccinated at six weeks for Canine Parainfluenza-Bordetella Bronciseptica Canine Distemper, Adenovirus Type2, Parainfluenza, Parvovirus. It is very important for you to conitnue your puppy's vaccinations. Usually 3 to 4 weeks apart for three to four more times depending on your vet. Future vaccinations are at buyers expense. 4. We also deworm your puppy every two weeks from birth until you take him/her home. This deworming is also for parasites like Coccidia/Giardia, but deworming must continue to be done until all or any worms and parasites are gone, your vet will do a stool check and will let you know if further dewormings are needed. This is also at buyers expense. 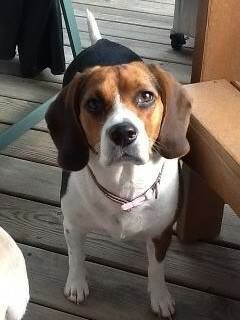 Gracie Mae Chidester is now two years old. 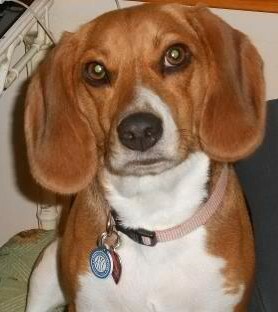 Thanks for the best dog ever Beagle Barn! Thank you! Thank you! Thank you for our darling Rowdy who turned 1 this week. He is the center of our family and the giver of more love and laughs then we ever could have imagined! Thank you for our sweet Rowdy Billings Lundgren. We are so lucky to have him as our dog! Hi Linda, Annas' Birthday is 1-1-11. We love her to pieces. She is a wonderful member of our family! She just loves the grand kids. Thank you! 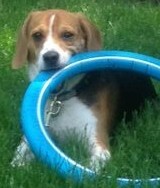 "This is Bishop(chip) we got him from the beagle barn in 2011. 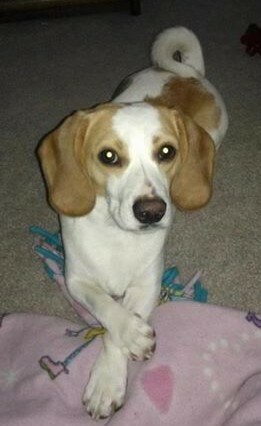 He has been a great addition to our family could not have asked for a better beagle. Thank You Linda"